Continued from Council (Extraordinary) 30th April 2013 Declarations of Interest, Mayor’s Communications, Petitions, Minutes, Leader’s Announcements. There are many documents for this agenda item which can be found on Wirral Council’s website. The Mayor referred to Standing Order 5H. Cllr Phil Davies moved the revisions to the constitution, Cllr Ann McLachlan seconded them. There were two amendments, one was proposed by Cllr Jeff Green and seconded by Cllr Lesley Rennie, the second was proposed by Cllr Tom Harney and seconded by Cllr Phil Gilchrist. The Mayor said he had been advised by the legal officer that Cllr Phil Davies had fifteen minutes and it would be dealt with as one debate only but with separate votes on the two amendments. Cllr Phil Davies said he was moving the recommendation from Cabinet which had been forwarded to Council around the revisions to the Council’s constitution. He said that the changes that they were discussing had their origins in the recommendations from the Corporate Peer Challenge, which had taken place last October. It had resulted in a detailed report, which contained a recommendation that the Council should “take the urgent steps you have identified to strengthen governance, make sure you complete a full review of your decision-making currently including the Scheme of Delegation assuring the arrangements are understood and adhered to”. He referred to a review of the overview and scrutiny system arrangements including how councillors were supported by the organisation and how they would get independent and impartial support from the Corporate Policy Unit. They had sought the expertise of the Centre for Public Scrutiny, whose director was present at one of their councillor seminars. The Corporate Challenge Team had also noted they’d started to consider the role of Neighbourhood Forums, as part of this they’d looked outside Wirral for examples of good practice. Cllr Davies said these issues had already been included in the Improvement Plan, which was part of the work that the Improvement Board had carried out. In addition to this there had been a smaller group of councillors called the Democracy Working Group chaired by the Deputy Leader of the Council looking at governance issues. There had also been five events for councillors, which had been generally well attended as well as a questionnaire that had been sent out to all councillors. Cllr Davies felt there’d been an exhaustive appraisal of all these matters in response to the recommendations of the Corporate Peer Challenge Team. He wanted to make it clear that the administration intended to continue to operate the Cabinet and Leader model, he acknowledged there was a difference of opinion on this issue between themselves and the other groups on the Council. Cllr Davies said he had not seen convincing evidence that changing back to the committee system would address all the issues that the Corporate Peer Team had raised in October. He said the changes were predicated on the Council continuing to operate the Cabinet and Leader system with improvements, which they believed was the best model to take forward. His observation was that any model works best if all councillors and officers have a positive mindset and engage constructively, which was their key challenge in changing the culture of Wirral Council. The aims of the changes were to improve their governance and decision-making procedures, ensure there was clarity about the role of officers and councillors, enhance the role of councillors not in the Cabinet through changing the scrutiny process, establish a new model of neighbourhood working achieving greater engagement with local residents and introduce a new procedure for Council so that it focuses on issues its responsible for and holds the Cabinet better to account. Cllr Davies said this recognised the outcome of the elections by giving the ruling [Labour] Group appropriate authority to carry out its policies but at the same time having a transparent process for holding the [Labour] Administration to account. He said the changes gave the opposition opportunity to question the Executive and propose alternatives. On scrutiny the six existing overview and scrutiny committees would be replaced with three policy and performance committees, which would broadly align with the three strategic directorates. There would also be a coordinating committee to oversee the new arrangements and deal with cross cutting matters. The key point he wanted to emphasise was that the new committees would be much more involved in influencing Council policy before it’s considered by the Cabinet. This would be moving away from the current model reacting to Cabinet decisions to a model which influenced policy. To be effective it would need joint working between the Cabinet and the new committees particularly around the Forward Plan. He gave his assurance that they would seek a new relationship with the Policy and Performance Committees and where possible take on board their views before decisions are made. The second change was the introduction of four committees based on the parliamentary constituencies to replace the existing network of eleven Area Forums. He claimed that the Area Forums cost £1,300 a year per each resident and that the footprint of the existing Area Forums was too small to coordinate services effectively to save money. Cllr Phil Davies said the new arrangements would save £391,000 would aim to have more strategic bodies with an emphasis on the priorities in the Neighbourhood Plans with an emphasis on tackling poverty and deprivation. Although these bodies would be initially given Council money, there was the expectation that this would be matched by money from other organisations. The Neighbourhood Officers would be based in each constituency whose responsibility would be to engage with local residents. The third set of changes were to procedures for full Council, Cllr Phil Davies said it was his belief that the current format didn’t work, that councillors spent time trying to score political points against each other and often dwell on issues that the Council wasn’t directly responsible for. The intention of the changes was to move to a procedure which focused on services delivered by Wirral Council, with an emphasis on written reports by the Leader and Chairs of the new Policy and Performance Committees. All would be able to be questioned by a councillor. There would still be notices of motion on the agenda, but these would normally be referred to Cabinet or the relevant committee unless Council thought the issue was sufficiently important to be debated by full Council. The scheme of delegation was also to be amended to introduce greater clarity and consistency around the roles of officers and councillors. He said that they intended that the new arrangements would apply from the start of the municipal year with the impact of the changes being monitored by the Standards and Constitutional Oversight Committee and the Leaders Board. He thanked all councillors who’ve engaged by attending seminars and filling out questionnaires. Cllr Phil Davies particularly wanted to thank the councillors on the Democracy Working Party. He said their aim was to improve governance and make sure they were more open and transparent about how they operate. Cllr Davies wanted to focus on taking the organisation forward on their key priorities which were tackling inequalities, delivering growth in Wirral’s economy and attracting new jobs and new investment and protecting vulnerable people. He also wanted to develop a new culture where they move away from a position where everything is politicised, to concentrating on practical improvements, which will improve the quality of life for residents who councillors represent. Cllr Phil Davies said the changes weren’t particularly radical, to quote a member of the Improvement Board, who attended the last councillor’s development evening, “They are not particularly transformational, they are what normal Councils do.” He said he hoped all councillors would engage with the new models of governance and resist the temptation to oppose everything without giving the changes a chance to work. Cllr Jeff Green then addressed his amendment. He said nowhere in the Corporate Peer Challenge did it say they should remove the right of councillors to debate in the Council Chamber on behalf of their residents. He also said he didn’t think the Local Government Association Improvement Board had said it either. He said that it was possibly the last debate in the Council Chamber not approved by the Labour Party, as in the future the Labour Party would decide would could or couldn’t be debated in the Council Chamber. Cllr Green said that Labour did have a majority and the right to determine the outcome of a debate, but what he took exception to what that they wanted to decide what is debated and what isn’t. He said that people were suffering due to the bin tax and increases in parking charges and the closure of…. At this point he was heckled by Labour councillors shouting bedroom tax. 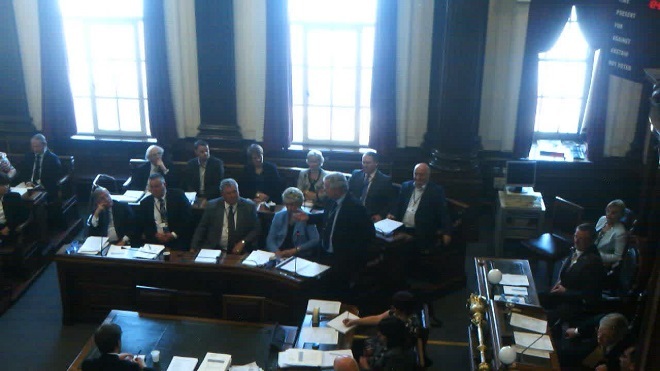 Cllr Davies heckled and was rebuked by the Mayor. Cllr Green quipped that he was glad to see that Labour wanted to end Punch and Judy politics. He said residents were suffering under the bin tax, the increases in parking charges and the closure of day centres, it felt prosaic that they were having a debate on the constitution. The reason he found the constitution important was because he saw its role as protecting the public of Wirral from an over mighty administration. Cllr Green said that it hadn’t taken very long for the administration and officers to determine “that’s all a bit messy having to go through these politicians, we just want to get on and do things”. He’d always said to officers that said that to him “perhaps you’re in the wrong job” and that councillors were inclined to think about the impact on their constituents. One of the elements was to remove the Children and Young People and Health and Wellbeing scrutiny committees. Given Wirral’s history and the abuse of the most vulnerable in society and child protection issues it seemed to Cllr Green a “backward and dangerous step” to remove any of the scrutiny. Continues at Council (Extraordinary) (Wirral Council) 30th April 2013 | Revisions to the Constitution | Conservative Leader Cllr Jeff Green responds “We remember the libraries, we remember Martin Morton, we remember what you did in closing care homes, we will make sure that these issues are publicly debated whether the Labour Party likes it or not”.